An 8-inch ear of corn contains about 0.50 lb equivalent of shelled corn grain; therefore, 112 8-inch ears would equal 1 bushel (1 bushel = 56 pounds). 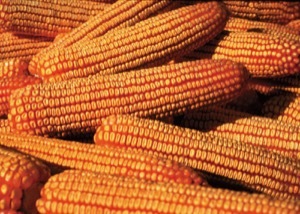 By counting the number of ears, the amount of corn can be estimated. If corn is planted in 30-inch rows, count the total number of ears in three different 100-foot furrow strips and divide by two to give an approximate number of bushels per acre. For example, after walking three, 100-foot strips, a total of 30 ears of corn were counted across all three 100-foot strips. Total ears of corn, which is 30, divided by 2, equals an estimated 15 bushels of corn per acre on the ground. Small ears and broken ears should be counted as half ears, while very large ears could be counted as an ear and a half. Any amount beyond 8-10 bushels per acre will require a well-planned grazing strategy to ensure that too much grain is not consumed by grazing cattle. If it is determined that there is excessive corn on the ground, the following are strategies to implement to help minimize the risk of digestive upsets (acidosis), lameness and abortions for cattle grazing the cornstalks. Limit access to corn by cross fencing the field and using a method called “strip grazing” where cattle are only given access to the determined amount of corn that they should eat for a given day. This method is the most reliable method for controlling corn intake. If downed corn is on an irrigated center pivot, one option for strip grazing is to attach the electric fence to the center pivot and move the pivot to move the fence. Consider the class of livestock that is going to be grazed. Cattle that haven’t grazed cornstalks before, such as weaned calves or yearlings, will often take time before they actively seek out corn. This can give the cattle time to adjust and acclimate to the corn. Weaned calves or yearlings can also make best use of the corn and convert it into a saleable product as they are growing and adding pounds that can be marketed. Non-pregnant cows that would benefit from gaining weight are another class of livestock that can be a good choice for grazing downed corn. Cull cow prices often seasonally increase from the late fall into the spring which complements the use of this resource. Cows that have previous experience with grazing cornstalks will seek downed corn immediately. Cows should be adjusted to corn prior to giving them access to the field. Start cows on 2-3 pounds of corn a day and work them up to 10-12 pounds per day over a 7-10 day period. Adjusting cows to corn will help to reduce the risk of digestive upsets. Have cattle full prior to turning out for grazing and provide good quality hay so cattle don’t over consume corn immediately. Feeding palatable hay or other feed daily can also help to reduce the amount of corn that cattle will be eating. The use of a Monensin supplement fed daily can help to stabilize feed intake and reduce the risk of founder and bloat which are caused by overeating. Managing cattle that are grazing cornfields with excessive downed corn can be a challenge for producers. However, with planning and strategy, cattle can clean up and make good use of this situation, benefiting both the farmer and the cattle producer.